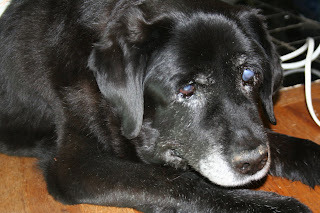 Today we said goodbye to our sweet Labrador, Jetta. She's been an uncomplicated, devoted companion and a bonding part of my family's history for 15 years. A couple of weeks ago she started wandering out under the sheltering cypress. A few days ago she began refusing her food. It took us a week or two longer than it took her to accept that she was ready to go. I work to hold gratitude for all our time together in the same heart as my sadness for the loss. As much as I wish we could have avoided the pain of this day, it is a bargain for all gained from her. Why don't I seem to care? It's a repeat, although I originally planned to use it on this post. We had a reprieve, and I didn't need it yet. Thanks for the extra time, Jetta...rest now.